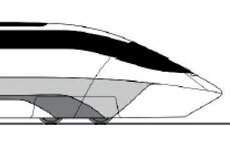 The maximum design speed of high speed trains is the maximal speed the train is operating in regular traffic. Due to certification and testing purposes the real maximum speed is higher. Historically the maximum design speed was understood as a constant value, which is depending on factors like distance to be travelled between two stops, traffic volume, energy cost etc. The study to be presented here aims to show, that the maximum design speed is a variable value depending as well on factors as willingness to pay, which is again depending on variables like airplane ticket prices or even petrol prices.